Among the awards to be presented, include the category of Veterans Choice, for which Travis Manion Foundation is one of three nominees. The Veterans Choice Award is presented to an individual or organization chosen by the community as a whole. The organizations nominated are highly admired and esteemed within the community by demonstrating leadership, excellence and public service. Travis Manion Foundation is one of three nominees for the Veterans Choice Award — but the winner is up to the public. Travis Manion Foundation is honored to be nominated as one of the top veteran nonprofit organizations in the country. This recognition of TMF's work in uniting communities to strengthen our national character is a testament to our Spartan community leading the "If Not Me, Then Who..." movement. 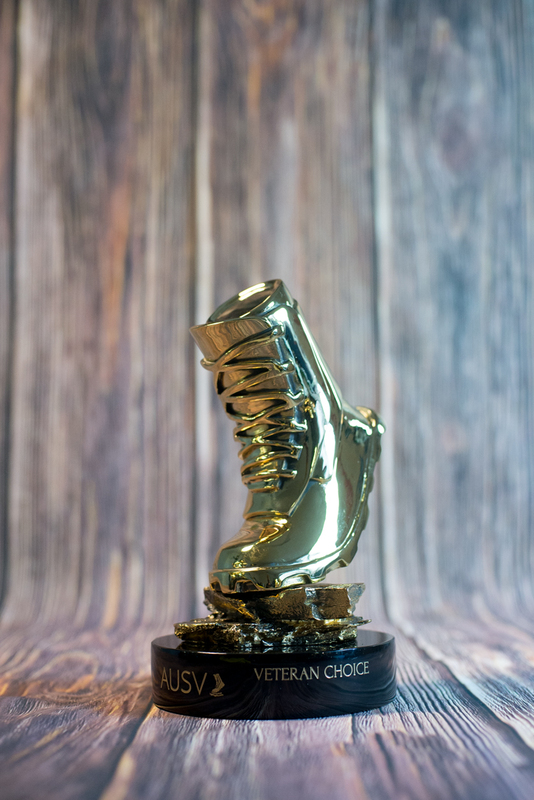 Praised by the community of our nation’s finest for its symbolic gesture of unity, empowerment, and collaboration, the 4th Annual Veterans Awards, also known as the Vettys®, presented by the Academy of United States Veterans and its partner organizations, will take place on Sunday, January 20th, 2019. The black-tie gala will honor individuals and organizations who have demonstrated relentless dedication and selfless service to the veteran community and their families. Among the awards to be presented, include the category of Veterans Choice, for which Travis Manion Foundation is one of three nominees. The Veterans Choice Award is presented to an individual or organization chosen by the community as a whole. The organizations nominated are highly admired and esteemed within the community by demonstrating leadership, excellence and public service. Voting for the Veterans Choice Award is the only category open to the public, and votes can be cast through January 17th by visiting http://www.travismanion.org/vettys. Additionally, TMF Chief Program Officer and U.S. Army Veteran Janaia Nash, has been nominated as a finalist for the Female Veteran of the Year Award. This award is given to the female veteran who has most demonstrated impact, value, and progress in empowering and advocating for women veterans across the nation. TMF President, Ryan Manion said: ""Travis Manion Foundation is honored to be nominated as one of the top veteran nonprofit organizations in the country. This recognition of TMF's work in uniting communities to strengthen our national character is a testament to our Spartan community leading the 'If Not Me, Then Who...' movement." The Vettys® focuses on organizational, individual and community excellence. For years, the veteran community and its leaders have made great strides in entrepreneurship, academia, leadership, community service, and beyond. The Vettys® provides a recognition platform for individuals and entities to be acknowledged for their tireless demonstration of distinction. The 4th Annual Veterans Awards will be organized in partnership with Disabled American Veterans, The Independence Fund, Coalition to Salute America’s Heroes, and Melwood Veteran Services. The ceremony will take place at the Watergate Hotel in Washington D.C. The Master of Ceremonies for the evening will be Jake Tapper, CNN Chief Washington Correspondent and Anchor of “The Lead with Jake Tapper.” Award presenters include George W. Casey, U.S. Army Chief of Staff; Shohreh Aghdashloo, Oscar Nominee and Emmy Winning Actress; actors Ian Bohen, Corey Feldman, Neil Brown Jr., and Board of Governors Chairman and Streetshares CEO Mark Rockefeller. With a relentless focus on the future, Academy of United States Veterans (AUSV) strives to have our veterans and other powerful communities work together to promote both what is morally right and socially impactful. We build sustainable bridges of trust, unity and respect between our service members and other influential communities through advocacy, community relations and media outreach. Our newsworthy events and projects open the doors of shared opportunities and a shared sense of community. Visit http://www.vetty.org for more information. Travis Manion Foundation (TMF) unites communities to strengthen America's national character by empowering veterans and families of fallen heroes to develop and lead future generations. In 2007, 1st Lt. Travis Manion (USMC) was killed in Iraq while saving his wounded teammates. Today, Travis' legacy lives on in the words he spoke before leaving for his final deployment, "If Not Me, Then Who..." Guided by this mantra, veterans continue their service, develop strong relationships with their communities, and thrive in their post-military lives by serving as character role models to youth. As a result, communities prosper and the character of our nation’s heroes lives on in the next generation. The story of 1st Lt. Travis Manion and his Naval Academy brother Lt. (SEAL) Brendan Looney have been publicized in the book Brothers Forever, and additional information about the Foundation can be found at http://www.travismanion.org.